home | Acid Test Chronicles | Additional Acid Test Poster & Handbi . 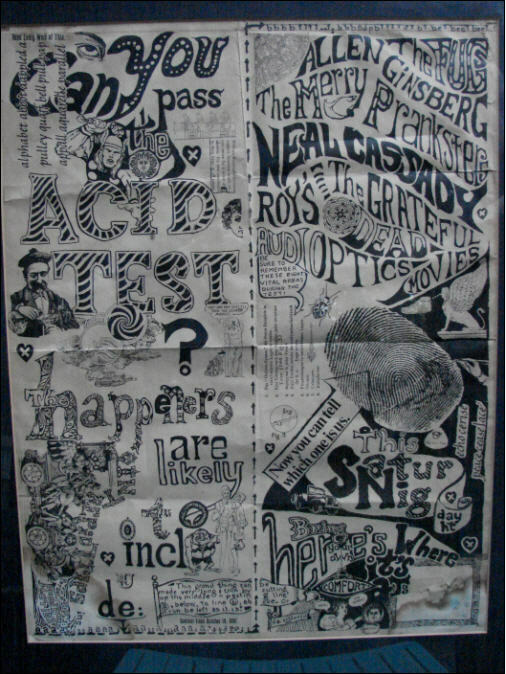 . .
One of 2 known White Colored Acid Test Posters. This one is also for the Fillmore Auditorium. No time, or location details, unfortunately. According to the original owner, it was obtained from Cody's books in Berkeley many years ago. It does not appear to be done in the style of the Pranksters though. It would be interesting to find out who colored it in. Very beautiful poster! 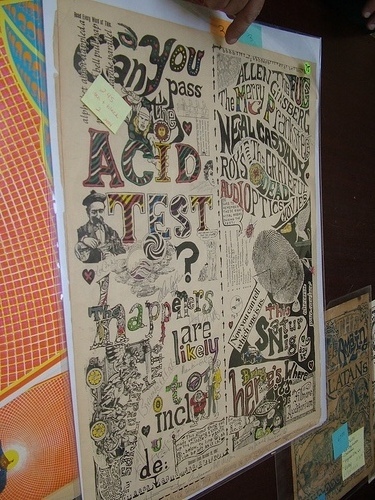 Here are a few examples of other known Acid Test Posters, Handbills, and Misc. Items. 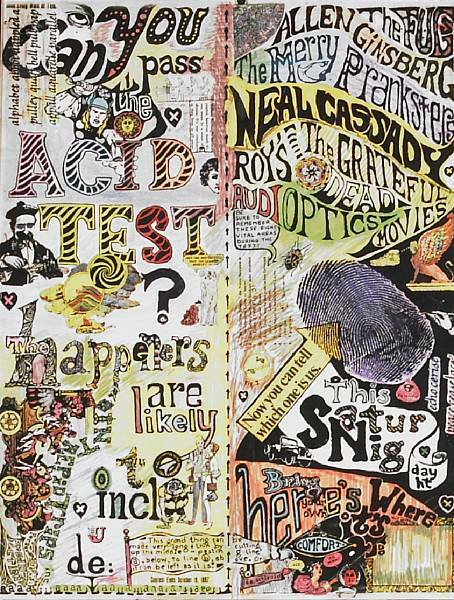 Here is a picture of the Acid Test Poster that was hand colored by Jerry Garcia and given as a gift to Vince Welnick for his birthday. It was not an original, but it was colored by Jerry Garcia. It should be considered an original piece of Garcia art. Here is a White Fullsheet Poster that turned up recently from Portland Oregon. It was found when a woman moved into an apartment complex in 1971 that was 7 miles from Beaver Hall, where the Portland acid Test was held. Not sure if there is a connection, but that is a close proximity. This poster may be available very soon, after some conservation has been done on it. Photo of the entrance to an Acid Test. This is the SignBoard made for the first Acid Test, showing the date as being Nov. 27, and the Grateful Dead playing the venue. 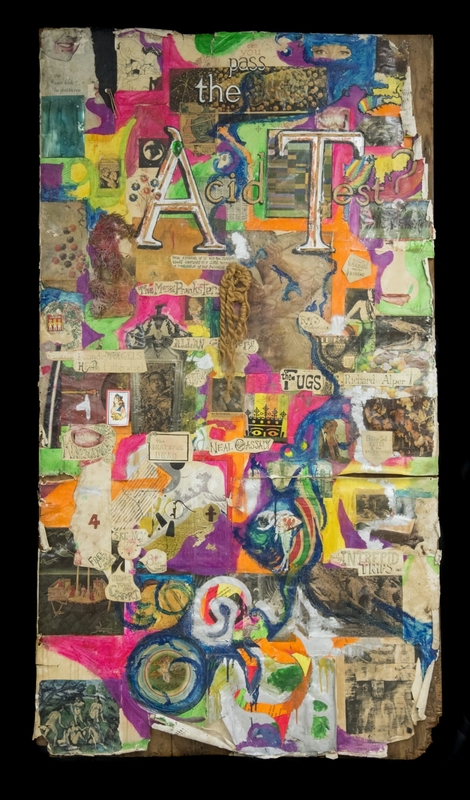 Currently resides in the Smithsonian, and purchased from Kesey in the 1990's.